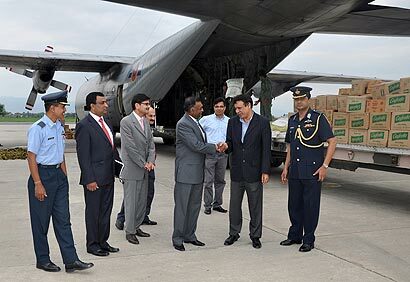 The Government of Sri Lanka handed over a stock of 18 metric tons of dry rations and medicine as emergency relief goods to the Government of Pakistan at Chaklala Air Base, Islamabad on 8th August. A fully equipped medical team was also deployed to help the victims. On behalf of the Government of Sri Lanka, the High Commissioner of Sri Lanka in Pakistan, Air Chief Marshal Jayalath Weerakkody handed over the delivered consignment of food aid to Maimat-Ullah, additional Secretary and the Coordinator for the flood relief operations of the Pakistan Prime Minister’s Office. The flood relief contribution was coordinated by the Ministry of External Affairs of Sri Lanka along with Lak Sathosa on the directive of President Mahinda Rajapaksa. Samba rice, red lentils, sugar, Chick peas, curry powder tea and other essentials worth nearly Rs 2.1 million were sent on a Sri Lanka Air force C-130 plane. Naimat-Ullah said that Sri Lanka has been a very special country for Pakistan and the relationship had always been exceptionally good and friendly and both countries have been there for each other in the hour of need. He profusely thanked the government and people of Sri Lanka for the kind gesture at this needy hour. Dr Muhammad Tariq, The Director of South Asia of the Ministry of Foreign affair of Pakistan, M.H.M.N.Bandara, Minister Counselor and Defence Advisor, Group Captain Sampath Thuyacontha of the Sri Lanka High Commission in Islamabad participated at the occasion. So far 14 million people have been hit by the worst floods in Pakistan’s history, killing at least 1,600. According to the Federal Flood Commission, the floods have swept through northern Pakistan regions of around 130,000sq km where 650,000 houses were destroyed. 557,000 Hectares of crop land has been flooded across the country and more than 10,000 cows have perished.